Greetings Distinguished Ruffians! Turk here to give you my two cents on Perdomo Cigars double aged vintage 12 year. The folks over at Perdomo describe the line of cigars as “ A blend of Perdomos finest and most cherished 12 year old fillers, binders, and wrappers, carefully bale aged for ten years and then barrel aged for an additional two years”. That’s right, they barrel aged them in bourbon barrels. This both surprised and intrigued me because I personally had never heard of doing such a process, maybe with beer, but with cigars? Two words came to mind, GAME CHANGER. Enough small talk, let’s get into the meat and potatoes of this review, shall we? The cigar comes in three different wrappers, Sun Grown, Connecticut, and Maduro and also four different sizes, 5×56 Robusto, 6×56 epicure, 7×56 Churchill, and the 6.5×60 Gordo extra. I myself went with the Connecticut 5×56 Robusto. The construction of the cigar was very smooth, with little to no veins and a tight wrap. Before I lit up I gave it a good sniff. I got scents of bourbon ( of course ) and a very faint almost creamy caramel smell from it, but it still smelled like a “ normal “ cigar as well, meaning that the sweet and bourbon like smell didn’t overpower the tobacco. We all know that some cigars smoke differently. Some cigars can start out great then get an uneven and difficult pull. Some cigars can fight you the whole way through. Then there are some that just pull perfectly. This definitely fell into category 3. It didn’t take much to get the cigar lit, or to keep it going. Sometimes I would have five-minute intervals between puffs and it would cherry up with no problem. The amount of smoke that I got from just a regular puff was amazing and caught me off guard initially. Say what you want about me, but I absolutely love a huge cloud of smoke bellowing around me while I’m partaking in a cigar. The flavor of the cigar was equal parts smooth and stout with just enough sweetness for one to notice, I actually was expecting it to be much sweeter than it was and was oh so delighted that it wasn’t. I’d have to say the flavor stayed the same all the way thru the cigar ( I actually nubbed it! ). It was a pleasant surprise that is tough to find in a lot of cigars. Overall, I could easily and without a doubt say that the Perdomo 12 year is a “go to“ cigar for when you are in a hurry to get out the door and need to grab a stick, it is guaranteed to please both the novice and seasoned smoker alike. It’s sure to pair well with your favorite beer, wine, or spirit, and for me was a pleasant post meal smoke. It truly stunned me at how versatile this stick is. So if you’re lucky enough to come across one of these bad boys at your local smoke shop go ahead and pick one up. The price is around $11.00 for one stick (price varies slightly depending on size and wrapper) and about $264.00 for a box of 24. I am certain you won’t be disappointed. 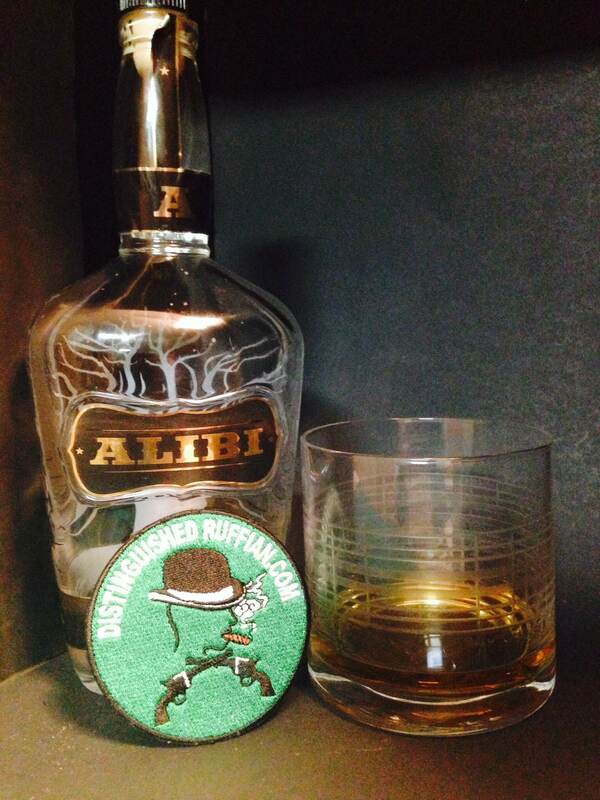 Turk signing off, and as always ladies and gents, stay Distinguished but… be a Ruffian. Cheers. Greetings my fellow ruffians, today I’ve decided to give a quick review on one of my favorite libations…WHISKEY! Alibi whiskey to be exact. For my birthday I was given one of few gifts a man can give another and surely be spot on, a bottle of Alibi whiskey. This instantly became one of my favorite go to drinks. If you are in need of a good three finger beverage to accompany your pipe or cigar or to just tune out the daily grind, then you should consider seeking salvation in this spirit. When I first cracked the bottle open, I do what I always do and gave it a good sniff. It seemed to me that initially you get a light citrus like aroma along with just the right amount of sweetness and then BAM, the whiskey punch that we all know and love. I always make it a point when trying a new whiskey to put it on the rocks to help open the flavor of the liquor. With that being said the makers of Alibi surely did not disappoint nor did they skimp when it comes to taste. The taste seemed to be the reverse from the smell, I got the nice whiskey punch with the sweet citrus on the back end, and to me it had just the faintest taste of raisin which threw me for an unexpected (but oh so delightful) loop. I typically save my whiskey drinking for the evening but Alibi could easily be a refreshing daytime cookout beverage. Personally, I feel you can’t go wrong with three parts Alibi and one part cranberry for a great cocktail that is both easy and delightful to drink. The makers of Alibi truly held to their slogan that “Alibi American Whiskey is a smooth 90 proof American whiskey that is easy to drink, any way you want to drink it.” I will caution you ladies and gents, IT IS RIDICULOUSLY EASY TO DRINK! So as always, partake responsibly and enjoy.